Review current and forecasted tuition and fees for California Institute of Integral Studies, and just how these prices contrast to the U.S. average. Knowing the tuition related to going to California Institute of Integral Studies will enable you to plan financially for the next 4-6 years. Check out the data below to understand how California Institute of Integral Studies' price compares to other colleges and if you need to arrange for tuition increases. How do Tuition & Fees at California Institute of Integral Studies Measure Up To Other Colleges? The following table shows how California Institute of Integral Studies compares to other colleges nationally, regionally and by state. Full-time undergraduates at California Institute of Integral Studies paid $19,969 in tuition and fees in the 2017 - 2018 academic year, before adjustments for financial aid. Of this amount, the price of tuition totaled $19,649. The other $320 are added fees. Unfortunately, this college doesn't offer any reductions to students who live in state. How much does California Institute of Integral Studies cost part time? There continues to be a rise of 2.0% in California Institute of Integral Studies tuition and fees for out-of-state students in the past five years. Tuition grew by 2.0% and fees grew by 0.0%. This school year, students can expect to pay $20,364 if the growth keeps up. Due to price growth, the total expense of a four-year degree would be $83,909, and the total cost of a two-year degree would be $41,132, which doesn't include added costs for books, transportation, and room and board. 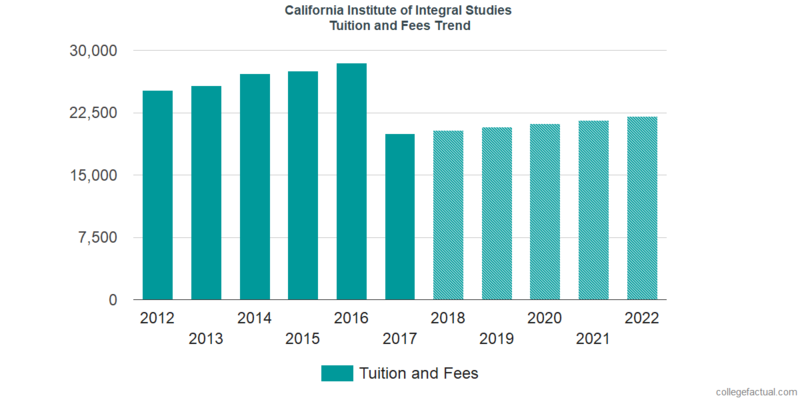 The following chart shows projected upcoming tuition and fees for undergrads at California Institute of Integral Studies. Take note of just how much the tuition and fees are increasing yearly. At many colleges students will wind up paying a higher price for their last year of school compared to what they did for their first. Find our answers to frequently asked questions and get additional information about college tuition and fees.